Researchers believe they have uncovered a promising opportunity for reaching smallholder farmers in developing countries with vital crops that could help them respond to a host of challenges including climate change and malnutrition. It could have important implications for the way seed sales and distribution are organised, particularly in sub-Saharan Africa. For decades, scientists have developed new crop varieties aimed at responding to the most persistent environmental and nutritional challenges faced by smallholders. But many of these have not made it to the people who need them most – the farmers themselves. According to new research published in the journal Food Security today, that’s because the method for disseminating new seeds neglects some of the most important outlets used by smallholders. The paper explains that modern crop seeds are typically sold by a relatively small group of licensed agro-dealers clustered in major towns and cities. The seeds are certified for quality and sold to farmers in sacks often weighing five, ten, or even 20 kilos. But following what is thought to be the largest study of seed transactions to date, covering around 10,000 in Kenya, South Sudan, DR Congo, Zimbabwe Malawi and Haiti, researchers found that the majority of farmers in these countries do not buy seed from these so-called “formal” markets. Instead the majority prefer to use local market stalls, independent traders, and even “mom-and-pop” stores. These “informal” markets, while sometimes considered off-the-grid in terms of location, are often much more accessible for many farmers, especially women. Even though they don’t offer certified seeds, many farmers prefer informal markets, partly because they can buy from people they know and purchase in smaller quantities, enabling them to try different varieties at low risk. In addition, informal markets tend to stock a much wider range of seeds that those available from agro-dealers, which typically sell only maize and a small selection of vegetables. 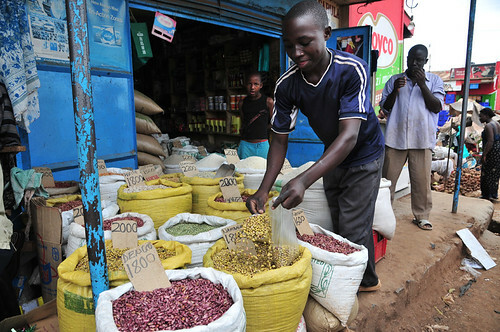 It means smallholders use informal markets to purchase as much as two-thirds of beans and other legumes – vitally important smallholder crops due to their protein content. Sperling and co-author Shawn McGuire of the University of East Anglia note that there has long been anecdotal evidence pointing to the importance of local markets as a source of seed. But they believe their study is the first to extensively quantify these transactions, crop by crop. They hope their findings could bring about recognition of the importance of informal markets, with a view to them eventually offering new varieties and high quality seed on a continuing basis. “Insights like these should help guide efforts to get new varieties to the farmers who really need them,” he said. “This can help ensure that the hard work to develop beans that can tolerate drought, or high temperatures, or that contain higher levels of micronutrients, can be accessed quickly and easily by farmers. The study’s conclusions come from a long-term a collaboration involving CRS, CIAT, the University of East Anglia School of International Development, the Pan-African Bean Research Alliance, and the United States Agency for International Development (USAID).